Having looked at the groceries that are more expensive and about the same, we now come to the exciting part: what are the Mexico food bargains? The fact that fruits and vegetables are both plentiful and cheap in Mexico was not unexpected; in fact, it was one of the criteria I had in mind when searching for a future home. Ajijic did not disappoint, but it still managed to surprise. First, there were the berries. Turns out that Driscolls — the world’s largest berry producer — has a huge farm just down the road in Jocotepec, where unripe berries are picked and shipped north to be sold all across the United States. 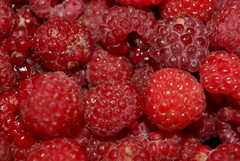 The ripe berries, however, won’t survive thousands of miles of travel. Guess where they go? Why, into the watering mouths of locals — and lucky visiting gringos. 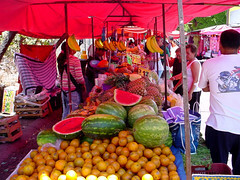 At tianguis and on street corners in towns all along the lake, you’ll see vendors hawking quart-sized cups of berries. For comparison’s sake, the week after we returned Fred Meyer had a front page loss-leader ad for blackberries and raspberries at $2 per dry half-pint (6 ounces), or $8 per dry quart. For Seattle, that’s a screaming good deal, if still more expensive (about $5.33 per pound) than nearly any other fruit or vegetable you could name. But now, after my anchor has been reset to one-tenth the cost … well, I’m not sure if I can bring myself to pay stateside prices for berries ever again. Once we were berry-saturated (something I hadn’t realized was possible), there were plenty of other fruit options. We ate avocados, mangos, pineapples, watermelon, grapefruit, oranges, bananas, cantaloupe, and papayas. I soon learned to consider limes a staple — something to have on hand at all times, like onions and garlic. At the tianguis each week I would treat myself to a 16-ounce cup of fresh orange juice, squeezed moments before, for 12 pesos ($.92). For 25 pesos ($1.92), we bought two ginormous mangos from a woman who peeled, seeded, and cut them into strips on the spot, crammed them in one of those quart-sized plastic cups, then sprinkled them liberally with salt, ground hot chiles, and fresh key lime juice. 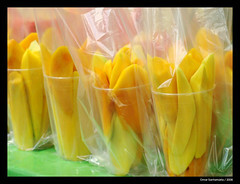 It was heavenly, and given how much I hate seeding mangos, worth every penny. Or centavo. Some things were priced by the item (large pineapple, 15 pesos or $1.15) or the bag (nopales, 10 pesos or $.77), and as our rental house lacked a scale I couldn’t make the conversion. For this and the other Mexico cost-of-living posts, I’m using an exchange rate of 13 pesos to the dollar, which was the approximate average during our stay. In the two weeks since we returned, the rate has risen to 14 pesos per dollar, which would make everything about 8% cheaper for Americans. Nopales, by the way, are the young pads of the prickly pear cactus. Apparently they are quite healthy, as well as being cheap — that 10-peso bag was already de-spined and chopped, and about the size of a basketball. Peppers of all kinds were in the 20-30 peso range. Mushrooms were 50 pesos per kilo, or about $1.75 per pound, compared to $3 or more in Seattle. Besides the above, we saw plenty of carrots, jicamas, chayotes, tomatillos, green onions, red onions, cauliflower, globe eggplants, asparagus, leaf lettuces, cabbages, potatoes, beets, radishes, and english peas. Now, this is just a snapshot of prices in late April and early May; I don’t know which prices are steady year-round and which are seasonal. The only item that showed significant price fluctuation during the month we were in residence was avocados: they started at a low of 26 pesos, climbed up to around 35, and then fell back down to about 30. There was some evidence that this was supply-driven; I noticed fewer of the tianguis stalls selling avocados during the week with the highest prices. Avocados, like many fruits and vegetables, are theoretically a year-round product in Mexico, but there certainly could be seasons of abundance and scarcity. A few things — notably melons — are cheaper in the States at the height of the season than they were during our Mexico visit. I would say on average, however, fruits and vegetables were about one-third of the best annual Seattle prices, and in some cases as little as one-tenth. As a bonus, mature fruit trees are pretty common in local gardens, potentially making some portion of the food supply effectively free. 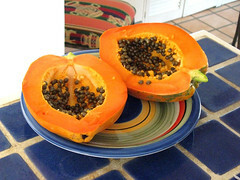 Our rental house had several, including a papaya tree that offered up a pair of huge fruits while we were in residence. Papaya is not usually one of my favorites, but that one was surprisingly good. Produce is especially important because we are a mostly-vegetarian household. I stopped eating meat and poultry a couple of decades ago, and although Jak is an omnivore in theory, in practice he eats what I cook, except on the rare occasions he goes out. I do, however, love seafood. We don’t eat it nearly as much as we used to when we were less frugal, or before I became conscientious about sustainability. 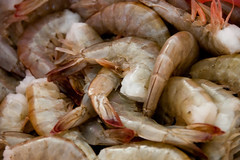 My first Mexican seafood purchase was shrimp, since I felt confident that it would be wild-caught rather than farmed and shipped in from Vietnam like most shrimp at home. 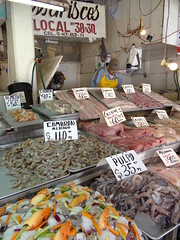 I spent two weeks comparing prices at tianguis and pescaderias before taking the plunge; they were pretty much the same everywhere, so I picked a place with a good reputation among expats. Purchasing fresh fish was a more daunting prospect, between language barriers, unfamiliar species, and my sustainability concerns. I didn’t work up to it until our last week in town. Nothing at the pescaderia was labeled, and I lacked both a) the experience to identify most fish from their whole form and b) knowledge of Mexican fish name equivalents. I was also hoping to choose something that wasn’t overfished, although I quickly ran into a snag: extremely limited information is available on the sustainability of Mexican-caught seafood. After a lengthy and truly frustrating research session, I finally settled on dorado, known to Americans as mahi-mahi: it was easy to identify in whole form, and according to Seafood Watch it grows quickly and is not under population pressure. Dorado fillets — deboned on the spot — were MX$125 a kilo. I bought .4 kilograms for 50 pesos; about enough for four servings at $.96 apiece. I pan-fried them with oil, lime juice, and white wine. Seriously, I was blown away by the flavor of that fish. That’s got to be one of the best fish experiences of my life, restaurants included. I have no idea why it was so shockingly good. Clearly I need to eat more fish in Mexico. Purely for research purposes, you understand. For Science! I also don’t know what fresh mahi mahi costs in Seattle. I’d guess somewhere between $12 and $18 per pound. All I know for sure is that frozen mahi never drops below my top ‘everyday’ buy price of $5 per pound. I didn’t have enough time to sort through the other fish and shellfish options, but prices in general seem to hover in the MX$80-$150/kilo range, or around $3-$5 per pound. ¡Maravilloso! There are a few other bargains worth mentioning. Spices are available in bulk, and although I didn’t manage a thorough cataloguing, seem to be very affordable. Corn tortillas are sold by weight at tortilleria counters, warm and fresh off the line. A kilo is about 45 6-inch tortillas and costs ten pesos — about a penny and a half apiece. And believe me, they put the weeks-old tortillas you buy in U.S. supermarkets to shame. Then there are a few Mexican items that are imported to the States — I’m thinking particularly of canned chipotles in adobo sauce, which Jak and I both love. Pricey here, at between $2 and $3 for a 7-ounce can, they’re about one-fifth the cost in Mexico. And no list of ‘cheap in Mexico’ would be complete without tequila. We tried four new-to-us brands of 100% agave reposado more or less at random — three mid-level and one cheap. The cheap one, at 55 pesos, was marginal in margaritas and no good at all for sipping straight. But Cabrito ($100 / 750ml) was pretty good, and El Tequileño ($155 / 1l) was excellent. 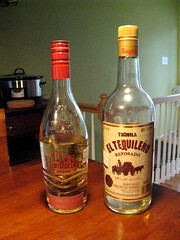 Our big score was a 700ml bottle of Don Roberto reposado, also excellent, that came packaged with a free 700ml bottle of blanco, on special at the large Playa licores shop (yes, an actual sale!) for $165.50. Standardized to 750ml bottles, that comes to about $7.70 for the Cabrito, $8.95 for the El Tequileño, and $6.85 for the Don Roberto on sale. Or put another way, ten bucks will buy you about twenty premium homemade margaritas. It never got old, walking out of the frutería or tianguis with a bagful of produce and realizing that I’d spent only a dollar or two. By learning the seasonal price fluctuations and building meals around what’s cheapest — much like I do at home with the weekly sales — I believe I can substantially drop our overall costs for seafood and produce, even while eating more fish and fruit than before. Add that to the staples that are already cheap in the States and a bit better than that in Mexico — like dried beans, pasta, white rice, flour, sugar, oatmeal — and I think we can more than make up for the increased price of dairy and some imported ethnic ingredients. Sure, we’ll miss some things — but that’s bound to happen anyway, unless you stay in the same place your whole life. I certainly am missing chile mango, and dorado, and blackberries over Blue Bell vanilla, and fresh-squeezed orange juice right now, so it goes both ways. Lots of things to look forward to when we return! What about organics and pesticide use? Any concerns there? Organic has not been a priority for me even at home; I sometimes get organic produce as a by-product of buying local, and occasionally on sale, but I don’t regularly seek it out for its own sake. Organic seems to be a mixed issue, scientifically speaking, and there’s a bureaucratic and marketing component as well — for example, I have been told by multiple local farmers that organic certification requirements are structured to be favorable to giant corporate endeavors and are prohibitively difficult for small farms. That said, there is a small weekly organic farmers’ market in the area, so if we needed more organic options we’d have them — albeit at a higher price. I MISSED THE FISHGASM!? horror! clearly a return trip is needed, stat. I know. So sorry that I didn’t manage fish while you were in residence, because it was really phenomenal. Here’s hoping it wasn’t a fluke (ha ha). So jealous that you experienced all that cheap and delicious food! Would love to visit Mexico one day. This excites me the most as we are big fruit & veggie eaters. 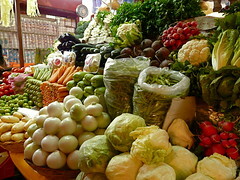 Bananas, oranges, avocados, young coconuts, mangos, papayas, berries……I think that would be heavenly and cheap. I hear Mexico produce calling us!!! I agree with the seafood. We purchased 2 kilos of Mahi Mahi and had four meals at 120 pesos per kilo. We also make fruit smoothies for lunch everyday and always delicious. Mexico is a great place with friendly people. Okay for all of you that think this is great, in Mexico its very difficult to make money hence the cheap prices. For example, a couple could work together making bricks and the company only pays to the American equivalent of 2 pennies. Please don’t being saying stuff like “oh yea i bought 4 mangoes for 2 dollars” because some people will never be able to taste a mango. I would like to know , if you can advise, which regions are cheaper, which are more expensive? I am rregular visitor, how are you everybody? This article postted at this website is truly nice.